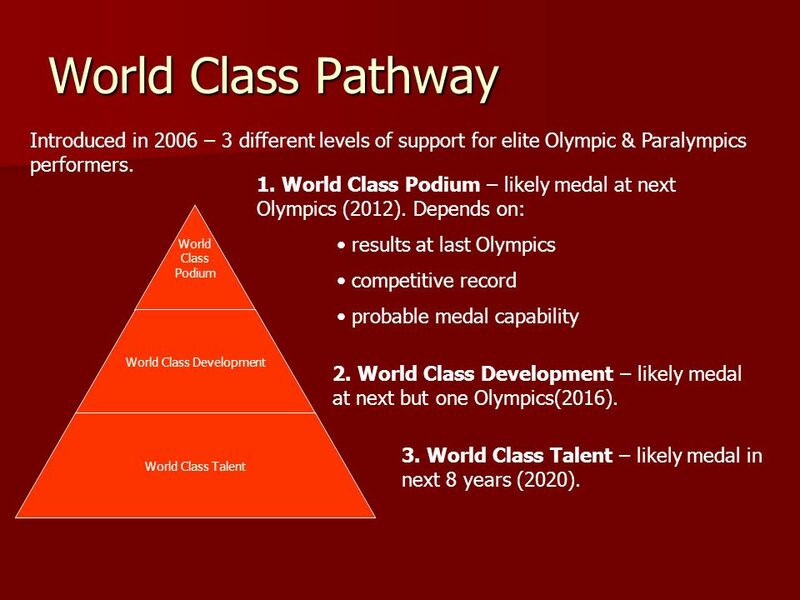 3 World Class Pathway Introduced in 2006 – 3 different levels of support for elite Olympic & Paralympics performers. 1. World Class Podium – likely medal at next Olympics (2012). Depends on: results at last Olympics competitive record probable medal capability 2. World Class Development – likely medal at next but one Olympics(2016). 3. World Class Talent – likely medal in next 8 years (2020). 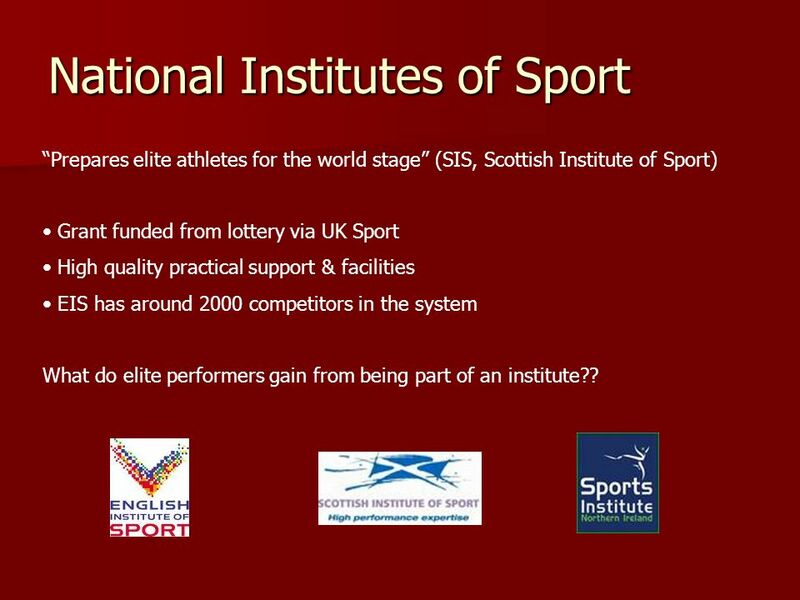 “Prepares elite athletes for the world stage” (SIS, Scottish Institute of Sport) Grant funded from lottery via UK Sport High quality practical support & facilities EIS has around 2000 competitors in the system What do elite performers gain from being part of an institute?? 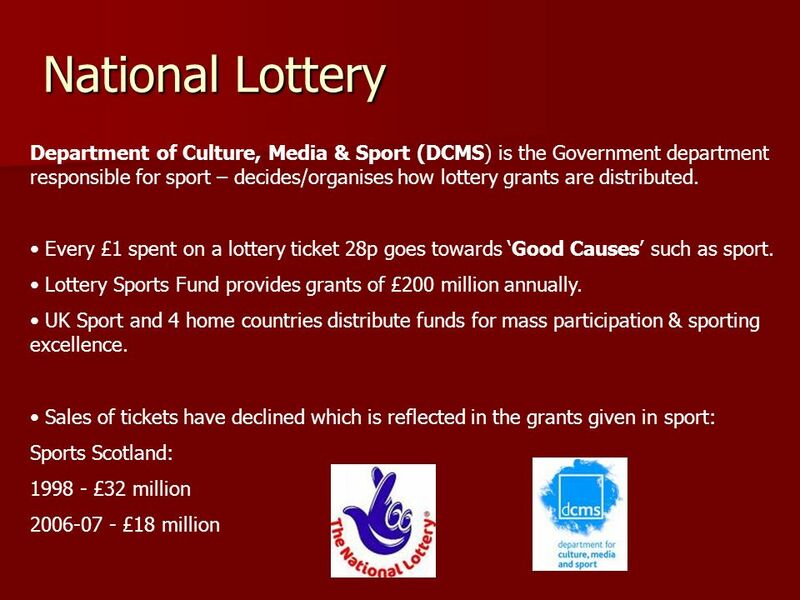 8 Funding of Sport Public Sector – funding from the Government & Local Authorities, National Lottery Private Sector – funding from businesses, companies, investors. One aim – to make money!!! 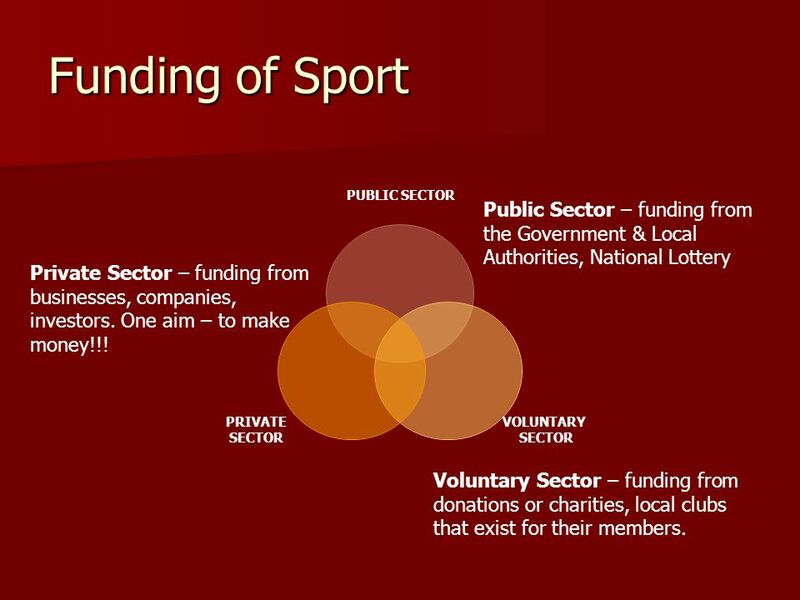 Voluntary Sector – funding from donations or charities, local clubs that exist for their members. 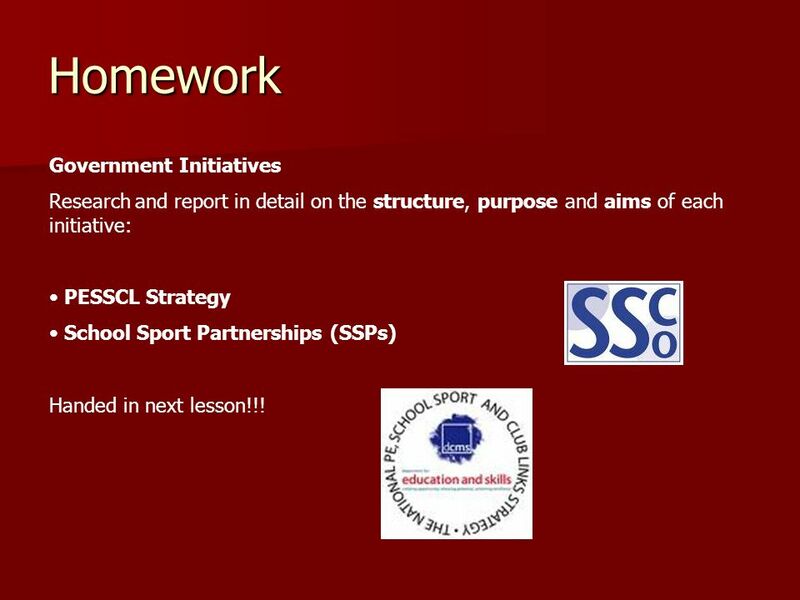 Research and report in detail on the structure, purpose and aims of each initiative: PESSCL Strategy School Sport Partnerships (SSPs) Handed in next lesson!!! 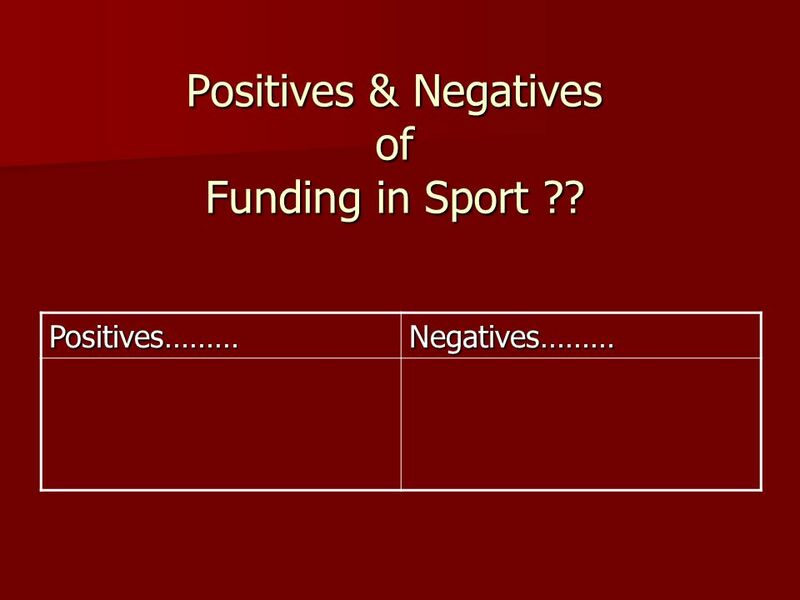 12 Positives & Negatives of Funding in Sport ?? 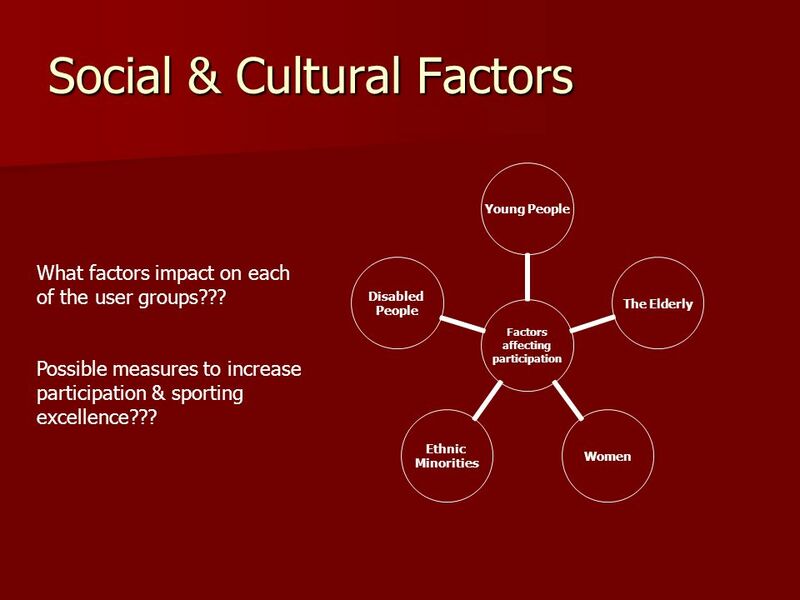 What factors impact on each of the user groups??? 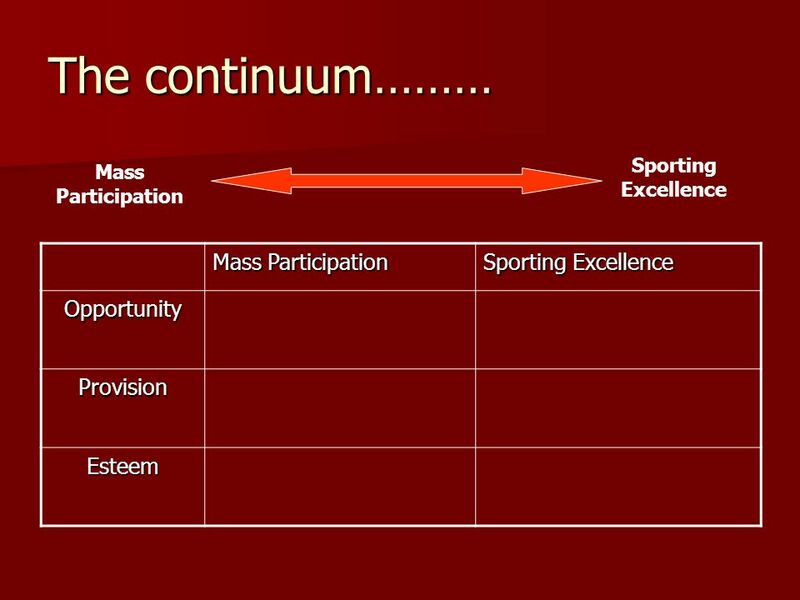 Possible measures to increase participation & sporting excellence??? 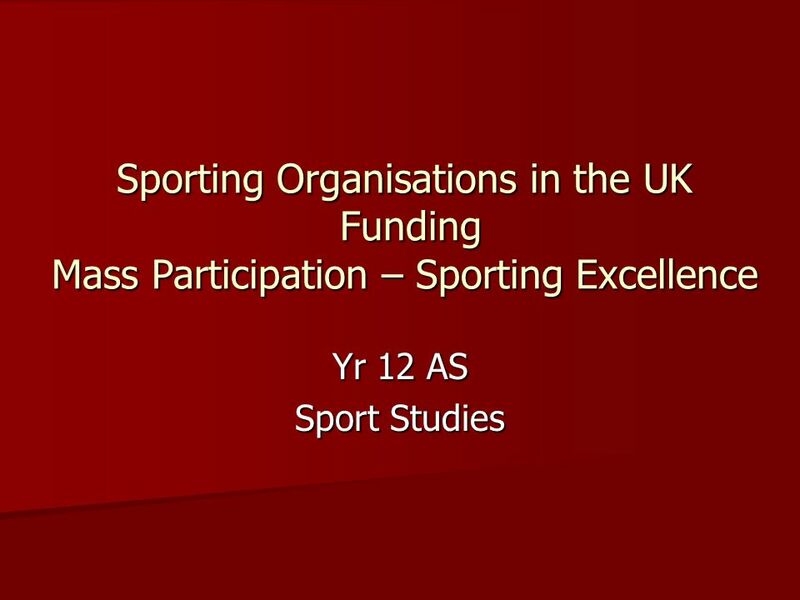 Download ppt "Sporting Organisations in the UK Funding Mass Participation – Sporting Excellence Yr 12 AS Sport Studies." April 2008 Sport Development Kim Lillie Senior Sport and Leisure Development Officer Presented by Serco Leisure. 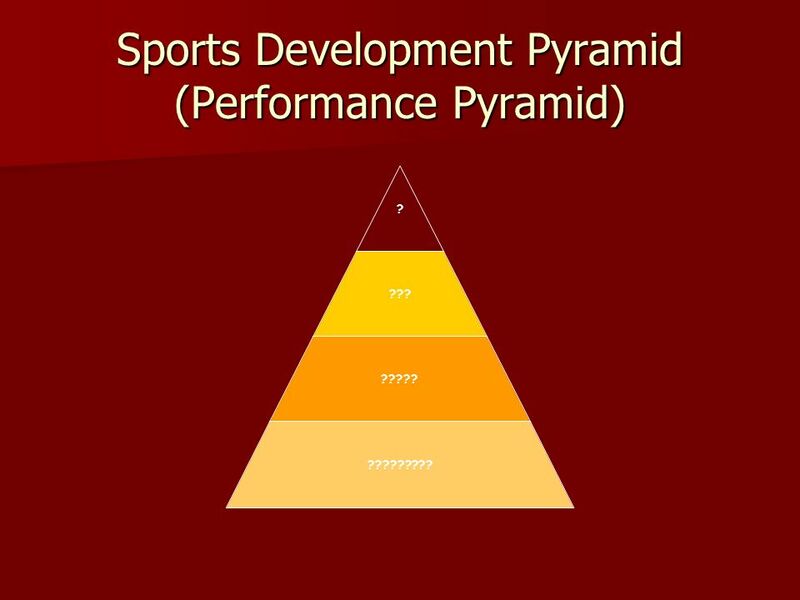 Unit 6 – Sports Development. Local councils or authorities whose aim is to provide a range of services for local people to improve their standard of living. 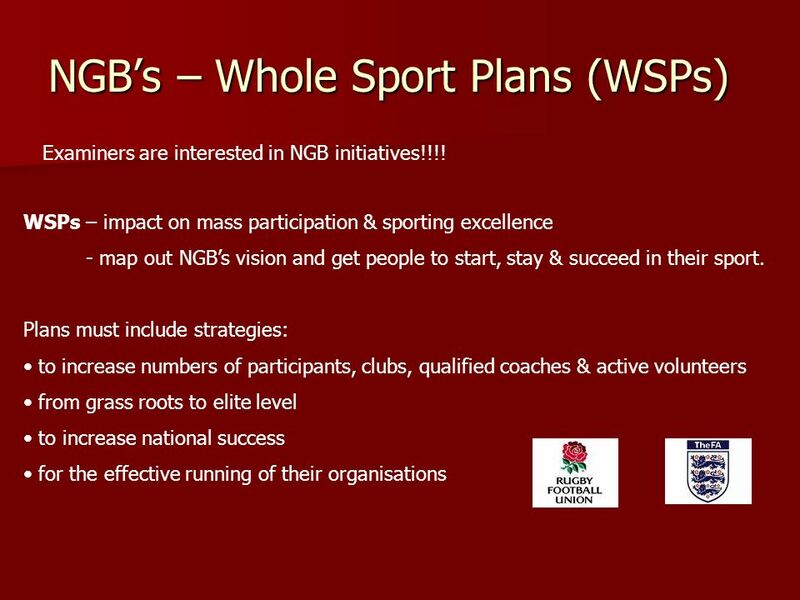 AS SPORT & PE The Influence of National Bodies: Learning Objectives……. 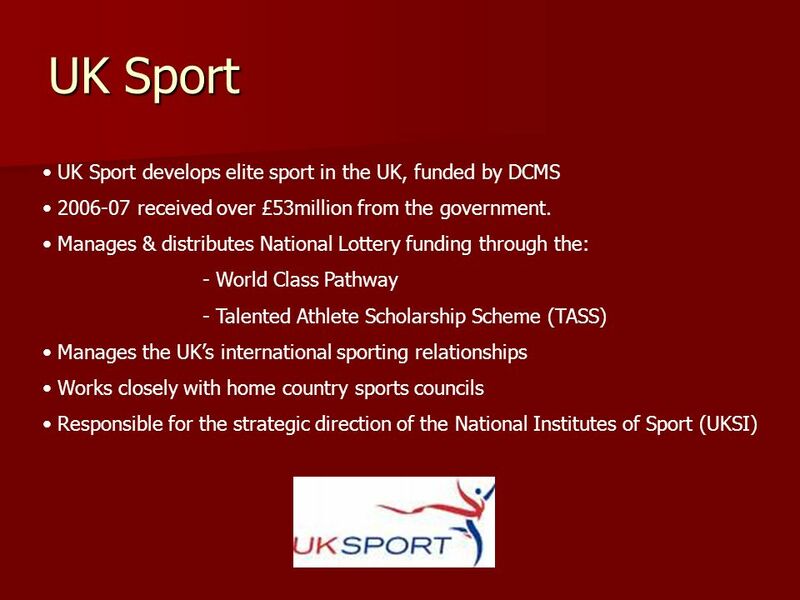 To define the role of Sport England in the development of sports participation To. 11 5 Hour Sports Offer for children and YP February 2008. Grass Roots to World Class Margaret Nolan – Head of Development Alex Newton – Performance Director. 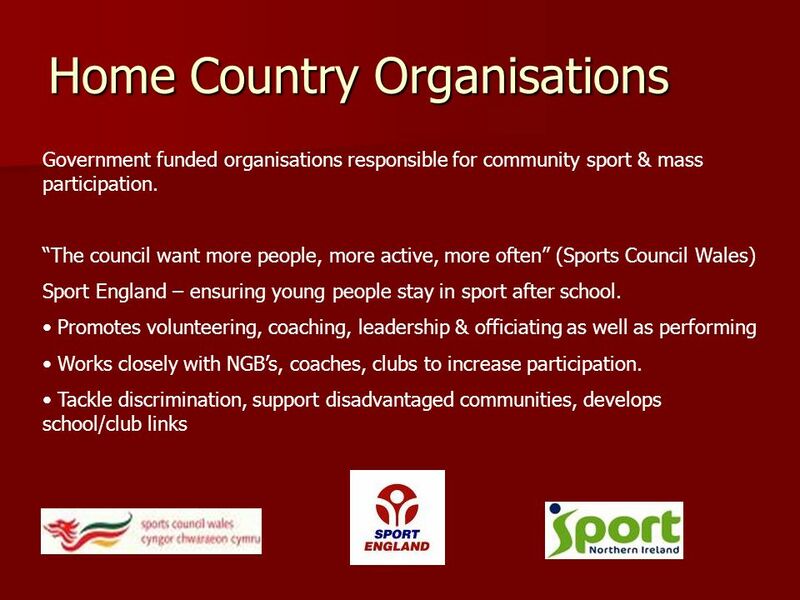 Matthew Delaney Regional Director Sport England London. National School Initiatives. 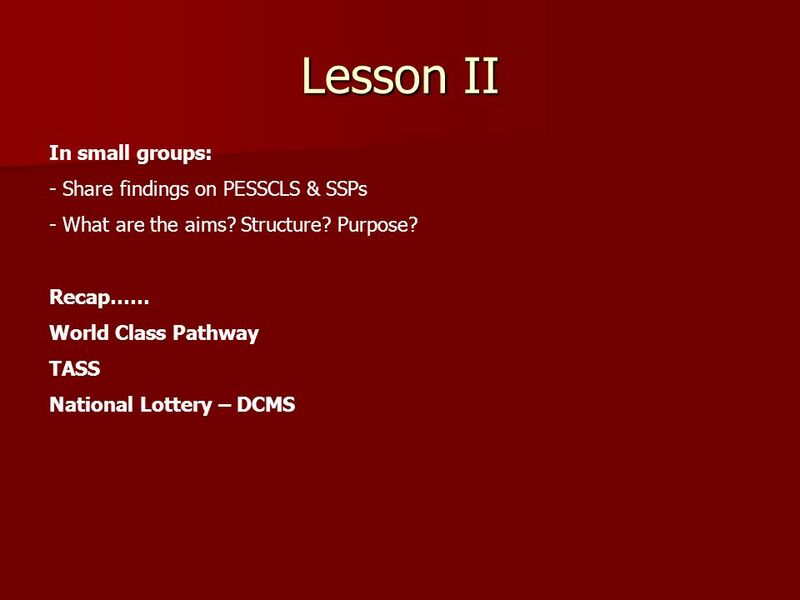 PESSCL Strategy Introduced in 2003 Target – “to increase the percentage of school children who spend a minimum of two hours. Talent Identification. 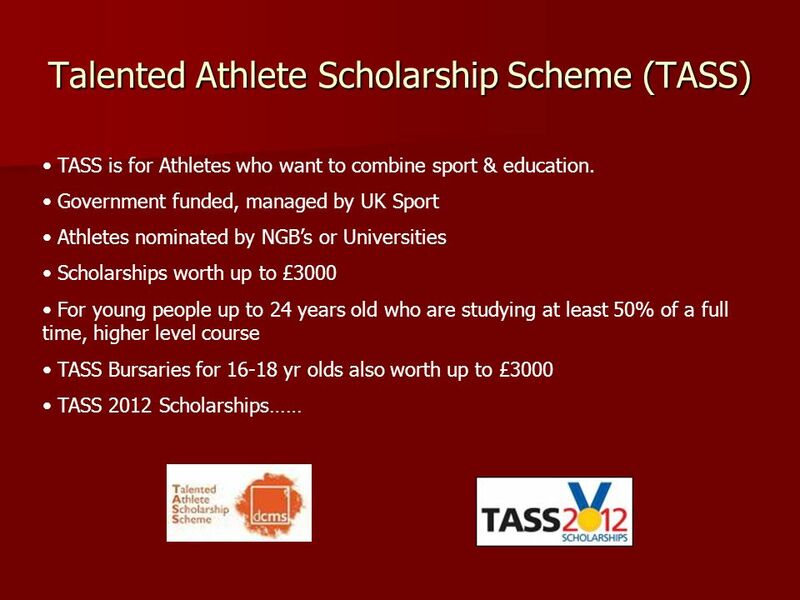 Talent Identification in the UK There are various schemes and agencies which deal with talent Identification in the UK NATIONAL. Sport in Schools. You will be working in pairs to teach each other about sport in schools. In your pair decide who is person A and who is person B. Person.